Description: These ledges are made of chinchilla safe pine. Chins like them because they provide a perch in the cage that they can to get to as a look out point or a good place to catch a nap. 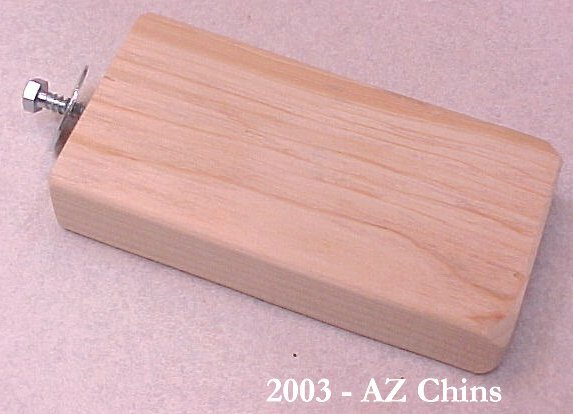 The edges are sanded to prevent splinters. Expect for the ledges to get chewed because they are made of wood! A half-inch wrench or socket with wrench is necessary to attach them to the cage. This allows for the ledge to be attached very tightly without a lot of spinning and movement like other ledge designs. All ledges are corner ledges with a hole drilled on the end and one side, but you will need to fastners to use it in a corner. In an order of one ledge there is one ledge with two fastners, in an order of two there are two ledges with three fastners and in an order of three there are three ledges and five fasteners. Refill Ledges are available, as well. These are just the wood ledges without any fasteners. 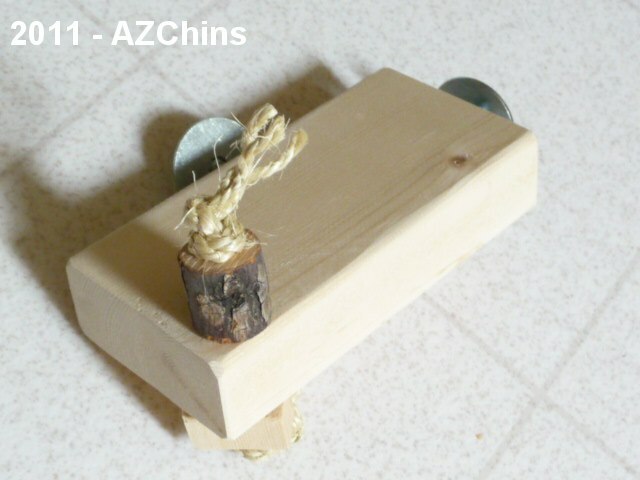 Reuse your old fasteners from your old ledges and save money. The fasteners will last for years and years, there's no real reason to throw them away! Available in plain or treasure. Treasure means I add some toy pieces for chins off to the end to chew as they lounge on their ledges. The size, shape and wood type of the toy pieces may vary. I can make custom ledges in whatever color you like or with the desired type or color of wood pieces - email with requests and I can accommodate any special needs in your order of ledges. Colors available on request: Blue, Green, Red, Pink, Yellow, Orange and Violet. I can offer special pricing on large orders of ledges greater than 6 at a time. Email for quote.